I know, I’m a couple of days late. And there is no possible way I could list all of the things I am thankful for. The first wealth is health, and that is the thing I am the most grateful for. Not only my health, but my family. The human body is an amazing thing. It’s incredible what we demand of our bodies. There was a day when I was certainly far more critical of my body. Today, I am thankful that it answers the call every day and allows me to work and take care of my children. My family kicked off Thanksgiving with a Turkey Trot in downtown Grand Rapids on an absolutely beautiful day. 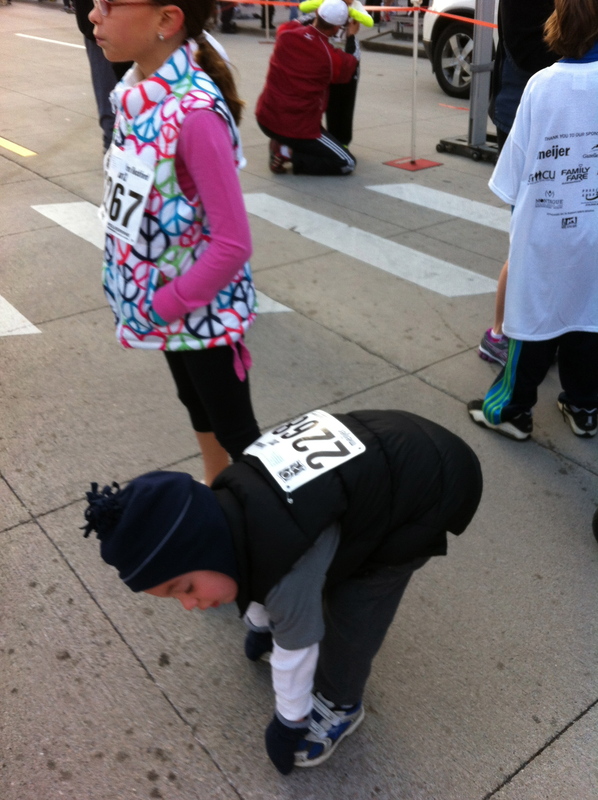 After the race, my 8-year-old daughter said, “Mom, now I know what you mean when you say it’s a great morning for a run.” You can see my 4-year-old son is getting in some last minute stretching before the big race. I was recently interviewed by a newspaper asking something along the lines of, “tips to avoid stress and stay healthy during the holidays”. My answer really focused on schedule. I believe the single greatest challenge this time of year for people in our profession, and our busy patients and clients, is schedule. Suddenly, all kinds of different events and celebrations start popping up and they get priority on the schedule. What makes it worse is that many of these things focus around (unhealthy) food. So, without launching into a long list of tips, my answer was simple: it comes down to priorities. People (including us) must continue to make time for our health and keep it at the top of the priority list even during our busiest times. I also wanted to take this time to make a recommendation. Many people who know me already know that I am addicted to Frontline, a documentary style show on PBS. Last week they premiered “Poor Kids” a piece that featured being poor in America, through the eyes of a child. It puts things into focus, especially when you think of the word “stress”. Stress is certainly subjective, but when you see children who are hungry and homeless, with basic needs that aren’t being met – it gives you some perspective. It also reminds us of the inequalities that are still present when it comes to health and quality of life. I think, given the time of year, everyone should watch it. I generally like the traditional “holiday” season in the United States, but I have to say it kind of grosses me out in some ways too. Not only is there an excessive amount of consumerism that takes place, but it’s glorified by the media. I really applaud those people who use this time of year to spend their time helping others, either with their time or donations. If you can spare the 50 minutes, I recommend watching “Poor Kids“. I promise, it will be time well spent.